Young ladies ages 8-16 are welcome to join the Myrofores. The name “Myrofores” designates the Myrrh-bearing women who went to the tomb of Jesus Christ early on the first day of the week to complete the burial rites that were postponed for the Sabbath. The Myrrh-bearing women were: Mary Magdalene; Mary, the mother of James and Joses; Mary, the wife of Cleopas; Martha of Bethany, Sister of Lazarus; Mary of Bethany, Sister of Lazarus; Joanna, the wife of Chuza the steward of Herod Antipas; Salome, the mother of James and John, the sons of Zebedee; and Susanna. 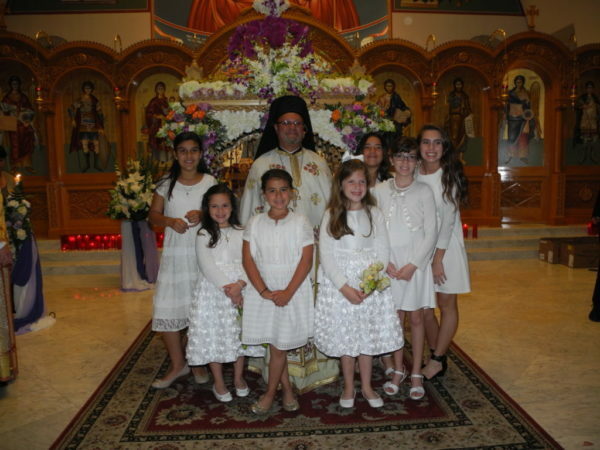 At Saint George we invite all young ladies ages 8-17 to be part of the Myrofores. The girls participate in the procession of the Icon of the Nymphios on Palm Sunday evening; process and stand watch at the Cross on Holy Thursday evening; and stand watch at the Epitaphios on Holy Friday evening. During the year, the Myrofores greet parishioners and visitors as the come into the Narthex of Saint George.